Dora García has been interested in changing perceptions regarding the legitimacy, marginality, and radicality of ideas for a long time, typically regarding thought on the political left and its cultural articulation. In this context, her recent focus on the controversial legacy of Martin Heidegger and his racist convictions comes as a somewhat unusual choice. Her project On Reconciliation unfolded in the wake of controversy following the first publication of Heidegger’s so-called “Black Notebooks” in the spring of 2014, which undeniably underscored the philosopher’s anti-Semitism and Nazism. 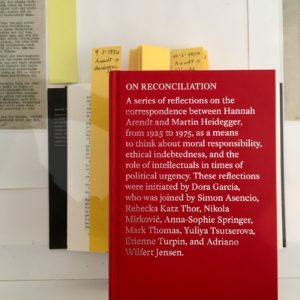 The resulting bilingual book On Reconciliation / Über Versöhnung is a search for clues about how to respond to a series of difficult subjects: the role of ethics in intellectual production, the relationship between private and political judgment, and the inheritance of toxic masculinity as the legacy of a major twentieth-century philosopher—as well as the recent confirmation that Heidegger’s racist views continued long after the end of the Second World War. However, with the centerpiece of On Reconciliation / Über Versöhnung being a selection of letters exchanged by Heidegger and Hannah Arendt between 1925 and 1975, it is less Heidegger’s official philosophy than these private epistles and Arendt’s own notion of “reconciliation” that form the point of departure for the contributions in the book. Re-reading Heidegger and Arendt’s correspondence in our contemporary political climate provides crucial ethical reminders for the ongoing relevance of critical practices of responsibility and memory that allow for a better understanding of our own situatedness within the contingent histories that condition the possibility of our actions. With contributions by Dora García, Simon Asencio, Rebecka Katz Thor, Nikola Mirković, Anna-Sophie Springer, Mark Thomas, Yuliya A. Tsutserova, Etienne Turpin, and Adriano Wilfert Jensen; including facsimile reproductions of selected letters between Hannah Arendt and Martin Heidegger. German translations by Herwig Engelmann; English translations by Kevin Kennedy and Andrew Shields. Design by Katharina Tauer. Verschwindende Vermächtnisse: Die Welt als Wald [Disappearing Legacies: The World as Forest] transforms the Tieranatomisches Theater into an endangered habitat: the forest. The exhibition confronts traditional images of nature in the context of species mass extinction, deforestation, and climate change. Drawing connections from Alfred Russel Wallace’s mid-nineteenth century expeditions to Amazonia and the Malay Archipelago to current issues of environmental transformation, the exhibition presents 14 works of contemporary art alongside rare botanical and zoological specimens. Together, inherited notions of nature are challenged to critically inquire into the legacies resulting from the relentless destruction of highly complex ecosystems. Installations, photographs, films, and sculptures reflect on biodiversity suspended between science and monoculture. Some of the artworks were developed through journeys to Brazil and Indonesia; others address the role of specimens and museum collections. Spending time on Borneo, Java, and Sumatra, photographer and filmmaker Armin Linke—together with his colleague Giulia Bruno and exhibition curators Anna-Sophie Springer and Etienne Turpin—conducted numerous interviews with local residents, plantation workers, small land holders, environmentalists, government officials, and scientists. The result is a cinematic document that reflects the speed with which Indonesia is currently transforming into a palm-oil nation amid giant peat fires. With her 19-channel video installation To See the Forest Standing, Maria Thereza Alves invites us to listen to the 34 Indigenous clan chiefs, whom she accompanied for one month last summer in Brazil while participating in a workshop on Indigenous agroforestry and resource conservation. Meanwhile, Revital Cohen & Tuur van Balen look inward and examine taxidermy birds-of-paradise with piercing X-ray vision, while the automated multimedia installation Extinction Gong by Julian Oliver & Crystelle Vũ translates the IUCN Red List of Endangered Species into an eerie and percussive rhythm in real-time. Another highlight of the exhibition is the 3D digital rendering of a Sumatran rhino skull, an exhibit that emphasizes the tension between scientific knowledge production and de-naturalization. As a CT scan, the skull provides scientists with new data while at the same time drawing public attention to the plight of this highly endangered animal. One-hundred and sixty years after Wallace deciphered the principle of species evolution during his journeys, Disappearing Legacies asks whether the living legacy of evolution and biodiversity—forests and the infinity of worlds they sustain—will disappear amidst the mass extinction of species current taking place on this planet. The exhibition will be accompanied the discursive program HOW ON EARTH? comprising of lectures, discussions, screenings, and guided tours. Verschwindende Vermächtnisse: Die Welt als Wald is a three-part project by Anna-Sophie Springer and Etienne Turpin. The travelling exhibition is realized by Centrum für Naturkunde at the University of Hamburg, where it was on view in the Fall of 2017. In 2018, adapted iterations are presented from 27 April to 26 August 2018 at the project partner, Tieranatomische Theater at Humboldt University in Berlin, and from 19 October until 14 December 2018 at the Zentralmagazin Naturwissenschaftlicher Sammlungen of the Martin-Luther-Universität Halle-Wittenberg in Halle/Saale. The exhibition cycle is a cooperation with the Schering Stiftung and the Goethe-Institut. The project is funded by the German Federal Cultural Foundation. Many inherited images of nature are no longer adequate given the realities of mass extinction, anthropogenic climate change, and deforestation. Have current forms of land use transformation, ecological disturbance, and species extermination produced a troubled new natural history? The discursive program How on Earth? addresses this and other urgent questions about nature, colonialism, and care in the Anthropocene through a series of lectures, discussions, screenings, and guided tours. 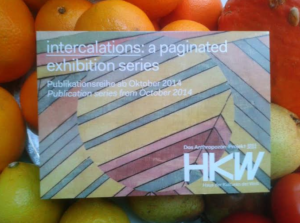 Entry to the exhibition and the discursive program is free. (25 August, 18–2h00) separate tickets for the Long Nights are required. 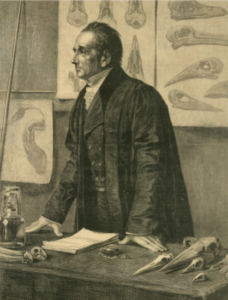 One-hundred and sixty years ago, Alfred Russel Wallace deciphered the principle of species evolution during research trips to South America and Southeast Asia. From 10 November 2017 to 29 March 2018, the special exhibition Verschwindende Vermächtnisse: Die Welt als Wald [Disappearing Legacies: The World as a Forest] confronts the destruction of these tropical habitats in the context of the Anthropocene and mass extinction. 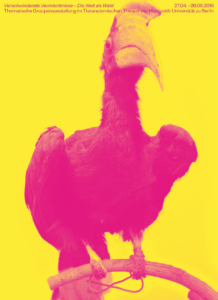 The concept of the project is unique—a hybrid between a historical thematic presentation and a major exhibition of contemporary art, transforming the Zoological Museum im Centrum für Naturkunde (CeNak), University of Hamburg, into a threatened (rain)forest habitat. The centerpiece of the intervention is the presentation of 13 contemporary works of art—including eight new commissions—by Maria Thereza Alves, Ursula Biemann, Bik Van der Pol, Shannon Lee Castleman, Revital Cohen & Tuur van Balen, Mark Dion, Radjawali Irendra / Akademi Drone Indonesia, Armin Linke with Giulia Bruno and Giuseppe Ielasi, Barbara Marcel, Julian Oliver & Crystelle Vũ, Robert Zhao Renhui / The Institute of Critical Zoologists, SHIMURAbros und autonoma / Paulo Tavares. Some of the works have a direct relation to the University of Hamburg’s collections. Through on-site visits, the artist Robert Zhao Renhui from Singapore, for instance, has further developed his ongoing exploration of our ambiguous relationship with insects by selecting a series of objects from CeNak’s Entomology Collection for his room-size installation. And it was a visit to the Mammalogy Collection that inspired the artist duo Bik Van der Pol to engage in a deeper examination of the phenomenon of nature as a replica situated between reality and fiction. Other artistic works were developed through journeys to Brazil and Indonesia. Spending time on Borneo, Java, and Sumatra, photographer and filmmaker Armin Linke—together with his colleague Giulia Bruno and exhibition curators Anna-Sophie Springer and Etienne Turpin—conducted numerous interviews with local residents, plantation workers, small land holders, environmentalists, government officials, and scientists. The result is a cinematic document that reflects the speed with which Indonesia is currently transforming into a palm-oil nation amid giant peat fires. In her museum installation, Maria Thereza Alves lends the word to 33 Indigenous clan chiefs, whom she accompanied for one month last summer in Brazil while participating in a workshop on Indigenous agroforestry and resource conservation. 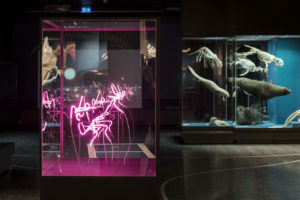 Revital Cohen & Tuur van Balen look inward and examine taxidermy birds with piercing X-ray vision, while the automated multimedia installation Extinction Gong by Julian Oliver & Crystelle Vũ translates the IUCN Red List of Endangered Species into an eerie and percussive rhythm in realtime. 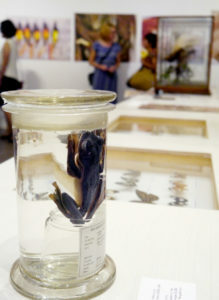 The exhibition is extended by a series of curatorial assemblages, which include specimens from the CeNak’s zoological collections and the botanical collections of the Herbarium Hamburgense that were selected in dialogue with the respective institutions’ scientific curators: skulls, animal skins, spirit specimens, herbarium sheets, and numerous cases of colorful pinned insects. Another special highlight is the 3D digital rendering of a Sumatran rhino skull, produced in collaboration with YXLON International, a Hamburg-based high-resolution industrial CT-scanner developer, and a special data visualization software from Volume Graphics. Other media include exclusive screenings of one of Sir David Attenborough’s earliest BBC documentaries and a selection of videos from the ornithologist Ed Scholes (Cornell Lab of Ornithology) and wildlife photographer Tim Laman’s ambitious Bird-of-Paradise Project. Together, the artistic positions and curatorial assemblages presented in the exhibition Verschwindende Vermächtnisse: Die Welt als Wald renounce a romantic image of untouched nature, and instead critically inquire into the legacies resulting from the relentless destruction of highly complex ecosystems. Alongside the exhibition, CeNak offers a variegated event program comprising of guided tours, lectures, screenings, and other evening events. Entry is free. Verschwindende Vermächtnisse: Die Welt als Wald is a three-part project by Anna-Sophie Springer and Etienne Turpin. The travelling exhibition is realized by Centrum für Naturkunde, University of Hamburg, where it will be on view from 10 November 2017 until 29 March 2018. In 2018, adapted iterations will be presented at the project partners, Tieranatomische Theater (TA T), Humboldt University Berlin, and the Zentralmagazin Naturwissenschaftlicher Sammlungen, Martin-Luther-Universität Halle-Wittenberg, Halle/Saale. The exhibition cycle is a cooperation with the Schering Stiftung and the Goethe-Institut. Ursula Biemann’s participation is supported by Pro Helvetia. The project is funded by the German Federal Cultural Foundation. The Trees typeface used in the graphic design is an open-source project by Katie Holten (2015). 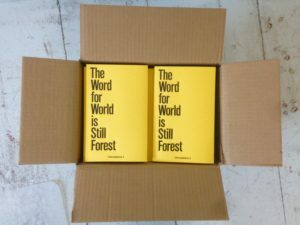 … creates a space for the reader-as-exhibition-viewer to consider how forests may be seen not only for their trees, but also how they can enable experiences of elegance, affirmation, and creation for a multitude of creatures; in response to their violent destruction, which characterizes the Anthropocene, these pages traverse various woodlands by way of their semiotic, socio-political, historical, and epistemic incitements in order to reveal how practices of care, concern, and attention also enable humans to inhabit and flourish in this world as forest. With contributions by Sandra Bartoli, Dan Handel, Katie Holten, Elise Hunchuck, Eduardo Kohn, Ursula K. Le Guin, Silvan Linden Shannon Castleman, Yanni A. Loukissas, Pedro Neves Marques, Abel Rodriguez, Carlos Rodriguez, Catalina Vargas Tovar, Paulo Tavares, and others. Reviewed by Jason Groves, Open Humanities Press’s Feedback Blog, 13 July 2017.
unfolds an itinerant encounter with nineteenth-century European naturalists in the Malay world, where the theory of evolution by natural selection emerged alongside less celebrated concerns about mass extinction and climate change; by re-considering the reverse hallucinatory condition of colonial science in the tropics—how scientists learned to not see what was manifestly present—the reader-as-exhibtion-viewer may exhume from the remains of this will to knowledge an ethical conviction of particular relevance for confronting forms of neocolonization in the Anthropocene. With contributions by Iwank Celenk, Lucy Davis, Fred Langford Edwards, Christina Leigh Geros, Matthias Glaubrecht, Geraldine Juarez, Radjawali Irendra, James Russell, Slave Pianos, Mark von Schlegell, Anna-Sophie Springer, Zenzi Suhadi, Paulo Tavares, Rachel Thompson, Etienne Turpin, and Satrio Wicaksono. 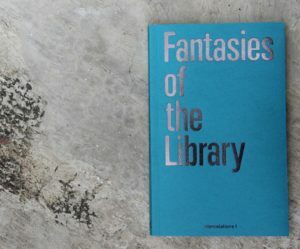 Fantasies of the Library lets readers experience the library anew. The book imagines, and enacts, the library as both keeper of books and curator of ideas—as a platform of the future. One essay occupies the right-hand page of a two-page spread while interviews scrolls independently on the left. Bibliophilic artworks intersect both throughout the book-as-exhibition. A photo essay, “Reading Rooms Reading Machines” further interrupts the book in order to display images of libraries (old and new, real and imagined), and readers (human and machine) and features work by artists including Kader Atta, Wafaa Bilal, Mark Dion, Rodney Graham, Katie Paterson, Veronika Spierenburg, and others. With contributions by Erin Kissane, Hammad Nasar, Megan Shaw Prelinger, Rick Prelinger, Anna-Sophie Springer, Charles Stankievech, Katharina Tauer, Etienne Turpin, Andrew Norman Wilson, Joanna Zylinska. ISBN: 9780262035200 | 160 pp. 5.125 x 8.25 in | 30 color illus., 15 b&w illus. Reviewed by Gill Partington, Times Literary Supplement, 18 January 2017, 33. Reviewed by Jussi Parikka, Leonardo On-Line, 4 April 2017. 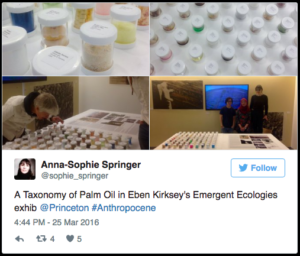 The mixed-media installation A Taxonomy of Palm Oil was first developed for the exhibition 125,660 Specimens of Natural History, Jakarta, 2015. The centerpiece of this installation is a collection of 100 specimens of products containing either palm oil or a palm oil derivative; these samples demonstrate the variety of manufactured goods which use palm oil, and connect every one of their consumer to the deforestation in the tropics. In Jakarta, these products where all sourced on the Indonesian market; when Eben Kirksey asked to include the project in his exhibition Emergent Ecologies, we produced a new version of the piece based on products that are available to customers in America. As an array of specimens nearly as colorful as those nineteenth-century cases of tropical butterflies or beetles, this collection presents the postnatural commodities annihilating tropical biodiversity in the Anthropocene. Our intervention in Unfold: The Volume Project, “The Lesson of Zoology: A Physis is being organized…,” departed from a lithograph, which first appeared during a visit to contemporary Lisbon. While researching the role of Lisbon’s Geographical Society in one of the first planetary colonizations, we happened upon an antiquarian bookshop with seemingly endless piles of natural history prints. Among them, “The Lesson” stood out as an especially compelling meta-image of just what a lesson is—an ordering of nature, by way of presentation, about who intended to possess the earth. Based on our found image, we decided to itemize the equipment that makes the discursive reality of a lesson compelling and the following eight terms thus structured our “library of folders” in the virtual reading room of Unfold: Organ; Apparatus; Report; Anatomy (Comparative); Professor; Model (Cosmos); Bone; and, Table. We filled these folders with a vast amount of files ranging from book chapters (many of which we scanned ourselves), to video and audio files, reproduction of historical images as well as works of contemporary art. 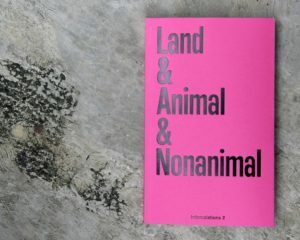 As a commission within the commission, The Center for PostNatural History in Pittsburgh, co-directed by Rich Pell and Lauren Allen, moreover contributed a selection of archival material from its collection which was digitized especially on the occasion of Unfold#2: The Lesson of Zoology. Read the project’s introductory essay, by Anna-Sophie Springer and Etienne Turpin with Walter Benjamin. Read an interview by Sara Giannini with Anna-Sophie and Etienne. To access the library of the—now archived—project download the .zip file at unfold.thevolumeproject.com > “FOLDED” > UNFOLD #2. The exhibition 125.660 Spesimen Sejarah Alam (125,660 Specimens of Natural History) was the first iteration of the ongoing curatorial research project—Reassembling the Natural—which addresses colonial natural history collections through the environmental transformations they produced. More specifically, the project engages with the contemporary legacy of the British naturalist Alfred Russel Wallace (1823– 1913), best known for co-discovering the theory of evolution by natural selection. From 1854 to 1862, Wallace travelled the Malay Archipelago, documenting the region’s biodiversity and amassing a gigantic collection of 125,660 specimens for European museums. In the context of his exploration, he also kept meticulous notebooks and journals, sent letters, and wrote numerous scientific articles and books, most notably the travel chronicle, The Malay Archipelago: The land of the orang-utan, and the bird of paradise—A narrative of travel, with sketches of man and nature, published in 1869 after his return to England. By inviting artists to retrace, re-appropriate, or reassess Wallace’s expedition, specimens, documents, and various artifacts, the exhibition 125.660 Spesimen Sejarah Alam explored how transcultural collaborative approaches to artistic and scientific practice can address urgent environmental questions. It took place from August to September 2015 at the gallery of the multi-arts center Komunitas Salihara in Jakarta, Indonesia, and presented works by 26 contributors—including ten newly created artworks by artists from Indonesia—alongside archival materials, historical objects, and zoological specimens from the Research Center for Biology, Indonesian Institute of Science (MZB/LIPI) at Bogor-Cibinong. With artworks and contributions by Ari Bayuaji, Shannon Castleman, Lucy Davis, Mark Dion, Fred Langford Edwards, Sigrid Espelien & farid rakun (EQUANORTH), Theo Frids Hutabarat, Geraldine Juarez, Flora Lichtman & Sharon Shattuck, Cindy Lin & Lintang Radittya, Aprina Murwanti & Bharoto Yekti, Intan Prisanti, Edwin Scholes & Tim Laman, Ary Sendy, Andreas Siagian, Zenzi Suhadi (WALHI), Laleh Torab, Satrio Wicaksono (Towuti Drilling Project), Tintin Wulia, Mahardika Yudha, Robert Zhao Renhui. The zoological specimens presented in the exhibition were selected in collaboration with Prof Dr Rosichon Ubaidillah, Dr Awit Suwito, Dr Amir Hamidy, Ir. Maharadatunkamsi, Dr. Djunijati Peggie, and Mohammad Irham from the Pusat Penelitian Biologi, Lembaga Ilmu Pengetahuan Indonesia (MZB/LIPI), Cibinong, Indonesia. 125.660 Spesimen Sejarah Alam was realized in partnership with the multi-arts center Komunitas Salihara and the Museum Zoologicum Bogoriense/Indonesian Institute of Science (LIPI/MZB) and in cooperation with Schering Stiftung. Additional support was given by the Goethe-Institut, the British Council, and the Office for Contemporary Art, Norway. For more information see the photo essay “Vestiges of 125,660 Specimens of Natural History” in Stedelijk Studies, No. 04, or visit ReassemblingNature.org. … is an ensemble which contends that the meaning of the Anthropocene is less a geological re-formation than it is trans-formation of both land and animal; once exposed to some of the parameters defining this transition, the reader-as-exhibition-viewer may begin to discern erratic rhythms generated by the creatures of nonconformity that inhabit, with their violence, struggles, and love the vast, machinic reality called Earth. With contributions by Mitchell Akiyama, Biance Baldi, Seth Denizen, Thom van Dooren, Arvo Leo, Natasha Ginwala, Richard Pell & Lauren Allen, Karthik Pandian, Etienne Turpin, Robert Zhao Renhui, Axel Staschnoy, and others. Reviewed by Xenia Benivolski, in Art Book Review, 6 June 2015. 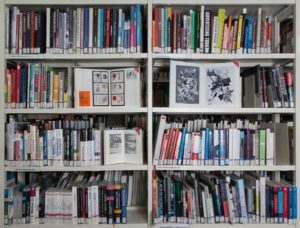 … is a sequence of pages wherein the reader-as-exhibition-viewer learns, rather surprisingly—but with growing conviction—that the library is not only a curatorial space, but that its bibliological imaginary is also a fertile territory for the exploration of paginated affairs in the Anthropocene. With contributions by Kader Attia, Andrew Beccone, Mark Dion, Rodney Graham, Adam Hyde, Erin Kissane, Raking Leaves, Hammad Nasar, Katie Paterson, Megan Shaw Prelinger, Rick Prelinger, Veronika Spierenburg, Anna-Sophie Springer, Charles Stankievech, Etienne Turpin, Joanna Zylinska, and others. 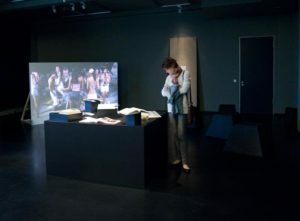 The intercalations: paginated exhibition series was developed by Anna-Sophie Springer and Etienne Turpin for the SYNAPSE Curators’ Network at the Haus der Kulturen der Welt, Berlin. The series in paperback format is published both as printed matter and open access, web-based editions. The aim of the series is to expand the discourse of curatorial knowledge production withing a broader multidisciplinary field of research, experimentation, and collaboration. Establishing a compact library of its own, the series asks how the Anthropocene thesis urges us to rethink traditional fields of knowledge. Each of the six volumes provokes thereby questions about the validity of seeming categorical binaries such as culture and nature, human and non-human, subject and object, book and exhibition. So far, four volumes were published since 2015; two more volumes are forthcoming in 2018. The project is co-published by K. Verlag and HKW in the framework of “Das Anthropozän Projekt.” It is made possible by the Schering Stiftung. Minor Ornithology is an ongoing curatorial research project of Anna-Sophie Springer and Etienne Turpin; it considers avifauna and their role in the development of human knowledge, aesthetics, and culture from a variety of perspectives and across a wide range of media. To date, the project has been manifest in exhibitions, across different public programs and research talks, and through publications and writing. As part of the 15th Jakarta Biennale (2013), Etienne also curated the performance and installation piece “For a Minor Ornithology” at the Pasar Burung Pramuka in Jakarta, Indonesia. Accompanying the performances are a series of diagrams designed in association with Jono Sturt, and an essay written by Anna-Sophie and Etienne. This essay, “Some Notes For a Minor Ornithology,” considers the remarkable role of avifauna in the history of European scientific experiments, public museum displays, and taxidermy practices. An interview with Etienne about the project from the Biennale is also available here. 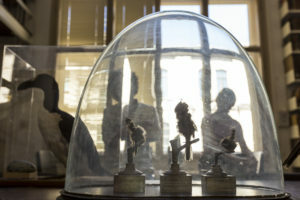 Other selected instantiations of Minor Ornithology include Anna-Sophie’s essay “Inter Folia Aves: Reading Birdbooks as Curatorial-Editorial Constellations” (2016); the workshop “Necroaesthetics: Life and Death of Natural History” (ECAL, 2016); the workshop “Little Birds / Little Machines,” (Berlin Natural History Museum, 2014) organized for SYNAPSE in collaboration with the ornithologists, Frank Steinheimer and Sylke Frahnert; and, a presentation Anna-Sophie gave in the framework of Mathieu Kleyebe Abonnenc’s panel at the 8th Berlin Biennale (2014). Minor ornithology will be continued in 2017 in the sixth volume of the intercalations: paginated exhibitions series entitled These Birds of Temptation. Additional forthcoming exhibitions of this material will be announced as they are confirmed. TRAVERSALS is based on a series of conceptual interviews with Dora Garcia, Chris Kraus, Mark von Schlegell, Charles Stankievech, and Jacob Wren originally produced for an installation in an art gallery. As a re-issue of these texts, the publication continues my interest in the book-as-exhibition. Each invited contributor has found a unique way to explore the hybrid spaces between genres and art forms, and the discussions focus especially on the role and relationship between visual art and writing. While the interview process was rather formalized—with one set of five identical questions posed to each person in the first round, and then five individual questions asked in a second round in response to the first five answers—the texts themselves delight through a personal tone and a great openness for both idiosyncratic trajectories and unexpected traversals between the five different chapters. 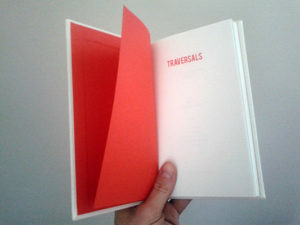 The material was originally produced for the piece TRAVERSALS (With Ladder) shown in the exhibition 5x5Castelló2011 at Espai d’Art Contemporani de Castelló, Castelló, Spain (8 July – 18 September 2011). 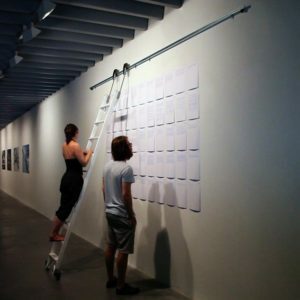 On the occasion of 5×5 the interviews were pinned to the wall in a grid while a sliding library ladder allowed for a playfully embodied reading experience. The spatialised format revealed the parallels in the conversations as well as their differences—particularly as the conversations evolve. Cleve Backster (1924–2013) was a CIA interrogation specialist who founded its polygraph (or “lie detector”) unit shortly after WWII. In the 1960s, he not only opened the longest running polygraph school in the world, the Backster School of Lie Detection, but also famously began to conduct biocommunication experiments with plants to see if they were sentient, something which he strongly came to believe. After first publishing his ideas in the International Journal of Parapsychology in 1968, it was not until 2003 that he published the book Primary Perception: Biocommunication with Plants, Living Foods, and Human Cells. 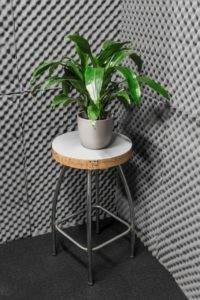 On the occasion of Charles Stankievech’s curatorial project CounterIntelligence, the installation Cleve Backster interrogates Janet Craig consisted of a Draceana house plant positioned in the corner of the exhibition’s soundproof interrogation room. The plant Backster experimented on in the 1960s is considered to be a Draceana, whereas Janet Craig is the name of a particularly attractive Draceana species. 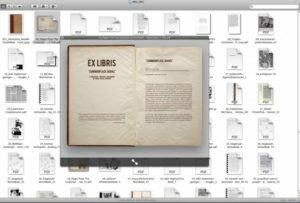 Realized in the summer of 2013, the multi-part EX LIBRIS project departed from investigating the inside of the book as a potential curatorial space. Initiated from within a series of specific libraries, EX LIBRIS comprised a number of book displays developed within these collections, where each iteration created its own constellation of meanings through the careful organization of selected publications ranging from mass-printed monographs to rare artists’ books and bound volumes to loose-leaf works on paper. EX LIBRIS was purposefully situated between the exhibition and the editorial process. Using the library both as a resource for curatorial connections “from book to book” and as a direct platform, EX LIBRIS expanded my research interest in the book-as-exhibition to include the relationship between the book and its context. 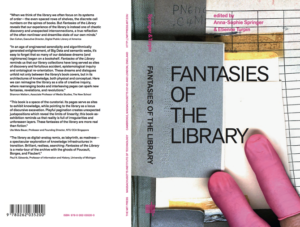 If the book traditionally is seen as the strategy for private consumption and research, and the gallery as the space for public exhibition and performance, the library—as the public place of reading—thus becomes the hybrid site for performing the book. 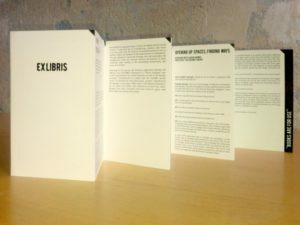 Each iteration of EX LIBRIS was accompanied by an individual miniature accordion publication published by K. Verlag and distributed for free in the exhibitions. 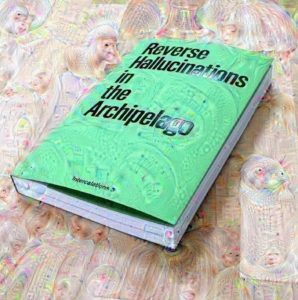 These booklets include interviews with the respective “hosts” such as the gallerist and publisher Barbara Wien and Sean Dockray, the co-founder of the online platform Arg.org, as well as contextual information and a bibliography of the books engaged at each site. A project curated by Anna-Sophie Springer with publication design by Charles Stankievech. With thanks to Beatrice von Bismarck, Claudia Dahmer, Wilma Lukatsch, Benjamin Meyer-Krahmer, Eve K. Tremblay, Thomas Weski, and Barbara Wien. The first book display in the EX LIBRIS series embraces this attitude of freedom and approaches the site of the public library at the Academy of Visual Arts, Leipzig as a repository full of useful objects, themselves repositories stuffed with ideas, materials, knowledge, memories, relations, and artworks—both in original terms and as countless reproductions and adaptations. Spread throughout the spaces of the library, a selection of books have been opened, arranged and assembled. Presented are images of works on paper, using paper; originals, sometimes themselves based on reproductions, shown in reproduction; books within books. As combinations of materiality, image, and text, the books perform themselves. The books are in use. With works by Marcel Duchamp, Candida Höfner, Martin Kippenberger, Sol LeWitt, René Magritte, Ulrike Ottinger, Dieter Roth, Ed Ruscha, Dayanita Singh, Daniel Spoerri, Ian Wallace, Andy Warhol, and others. Ray Bradbury’s science fiction novel Fahrenheit 451 (1953) has been the point of departure for an ongoing suite of work in progress by Canadian artist Ève K. Tremblay since 2007. The multifaceted project includes several photographic series, videos, texts, artist’s books, as well as public and private performances of the artist attempting to recite the novel from memory. On the occasion of the opening of EX LIBRIS, Tremblay could be witnessed traversing and occupying various places within the Academy Library, deeply engaged in her own memorization and recitation rituals. Attempting to absorb and learn by heart the text of an entire book is an extreme gesture for the intimate power in which reading shapes the way we think and thus who we are in the world. Furthermore, as a cognitive performance between becoming and forgetting EKTBF451-EKTFF451 pays a tribute to the boundless mental dimension always surrounding the material repository of the library. Subtitled with an adapted quote of Daniel Spoerri’s multilayered book project, Topographie Anécdotée* du Hasard (1961–98), the second book display in the series of EX LIBRIS emerged from personal conversations with the gallerists and publishers Barbara Wien and Wilma Lukatsch. 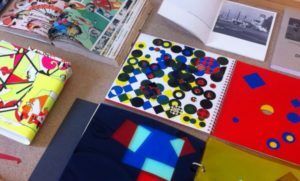 A desire to support the connections between art and the world of the book lies at the heart of the work of Barbara Wien and Wilma Lukatsch. Founded in 1988 by Barbara Wien as the press and bookshop “Wiens Laden & Verlag” in West-Berlin, by today, a quarter century later, Wien has developed the gallery and bookshop to one of Berlin’s most interesting places for art and publishing. Nowadays located at its fourth address, the gallery has a history of regularly showing exhibitions by artists for whom the book is a central medium and has always been extended by an exquisitely stocked bookshop specialized in rarities of Fluxus and Conceptual Art. In 1994 Barbara Wien edited the collected writings by Arthur Köpcke and in 2002 the collected interviews by Dieter Roth. Since 2008 Wilma Lukatsch and Barbara Wien have co-edited several books published by the press Wiens Verlag. One of these is the interview book Tomas Schmit / Wilma Lukatsch, Dreizehn Montagsgespräche, which is currently being translated into English. The publication series how to write, for which Wien and Lukatsch have co-edited several selected artist’s writings is a serial publishing project started in early 2013. Presented in and on several table vitrines, the display of Anekdotische Topografien is integrated into the everyday scenery of the bookshop. A constellation of publications reflects the history of the place while trying to map these works in a larger context of artists book production and the question of the book-as-exhibition. In the focus are books and bookworks by Nina Canell, Hans-Peter Feldmann, Gundi Feyrer, Arthur Köpcke, George Maciunas, Nam June Paik, Dieter Roth, Ed Ruscha, Tomas Schmit, Daniel Spoerri, Emmett Williams, and others. A complete series of Dieter Roth’s luxury edition of his Collected Works is displayed in a glass cabinet. Dating back to antiquity and with particular popularity in the Renaissance period, “commonplace books” are a type of scholarly notebook containing a collection of excerpted and copied passages that a person compiled and stored for future purposes such as reference and quotation. How to actually keep and organize a commonplace book was a small science in itself. John Locke’s text A New Method of Making Common-Place-Books (1706) suggested some techniques—one of which is a system of classifying and coding entries into a growing subject index, one’s personal potential encyclopedia. While physical notebooks remain a treasure to keep and even if we do not yet live in a truly paperless age, our commonplace of today is that we access and store a huge amount of information digitally. By engaging an online library, specifically the Arg library, “Commonplace Books” seeks to address shifts in how we approach notions such as the “common” or the “public” more openly and actively than ever. A PDF has been created from excerpted and copied passages of thematically relevant publications available in digital form in the Arg library. It has been uploaded back onto the platform and a link appeared in the “New Texts” section on http://grr.aaaaarg.org making it available to all network users. The Subjective Object engages with the controversial site of the ethnographic museum and the role of the archive. In particular, the 1920’s photographic archive of the indigenous people of India by the German physical anthropologist and racist theorist Egon von Eickstedt (1892–1965) serves as a case study for an investigation into the role of historical artifacts in light of contemporary political situations. The nine interviews with curators, artists, anthropologists, and social workers provide the core of the book actively discussing the complicated issues around the archive’s function in producing know- ledge. An annotated thread of images serves as a critical apparatus addressing the visual history of ethnographic display and classification practices—both in the scientific field as well as the cultural field at large. Questioning the assumption that the archive presents the “fact” of the “Other,” three literary texts counterpoint the inherent fantasies within scientific research. Just as the book begins with an archive—the Eickstedt photos—the book ends with a new archive—photos of the exhibition The Subjective Object – (Re)Appropriating Anthropological Images at the GRASSI Ethnographic Museum of Leipzig—illustrating the project’s desire to not only engage with the history of display but also to propose a future of display strategies and social engagement. 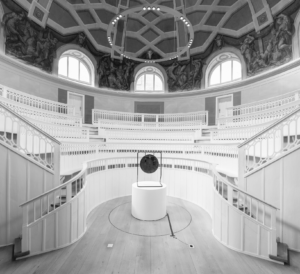 Interviews with Carola Krebs, Meghnath, Theo Rathgeber, Nora Sternfeld, Alexandra Karentzos, Christopher Pinney, Philip Scheffner, Britta Lange, Jeske Fezer, and Raqs Media Collective. Literary Texts by Franz Kafka, Brion Gyrin, and Suzan-Lori Parks. 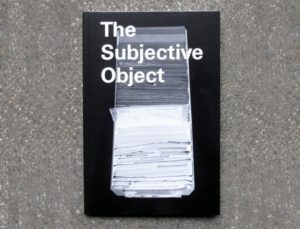 The book was published on the occasion of the exhibition The Subjective Object – Von der (Wieder-)Aneignung anthropologischer Bilder, GRASSI Museum für Völkerkunde zu Leipzig. Curated by Nicola Beißner, Anna Dobrucki, Anna Jehle, Julia Kurz, Anja Lückenkemper, Barbara Mahlknecht, Katja Thekla Meyer, Ksenija Orelj, Katharina Schniebs, Nefeli Skarmea, Anna-Sophie Springer, Edda Wilde, und Olga Wostrezowa. A project of “Kulturen des Kursorischen,” Hochschule für Grafik und Buchkunst, Leipzig. Exploring the use of humour in contemporary art, the exhibition, Ha Ha Road, presented the work of 25 international artists who play with “a rupture of sense.” Taking its title from the name of a street, the exhibition plays on its double meaning. Apart from its connection with laughter, a “ha-ha” also refers to a type of sunken boundary: a wall or fence set into a trench, forming a hidden division in a landscape while preserving the scenic view. This invisible frontier serves as a neat metaphor for our relationship to the world of laughter. Strangely indistinguishable from the familiar terrain of normality, a joke transports us to a place where sense breaks down, where the familiar is turned on its head, where the ordinary becomes extraordinary, and where the world means differently. Nothing has changed and yet everything has changed. This is the paradoxical condition of humour, and the source of its disruptive power. The show explores what it means to step over this barrier and to set foot into the inexplicable and illogical world of humour. The selected artworks demonstrate how acts of absurdity, irrationality or playfulness can interrupt reality and momentarily destabilise our common assumptions. The strategies used by the artists in Ha Ha Road serve to illustrate the liberating freedom of thought at work in humour. They invite us to look at the world from the other side of the fence. With artworks by Boris Achour, Chantal Ackerman, Bobby Baker, Dave Ball, Anna + Bernhard Blume, Stella Capes, Yara El-Sherbini, Fischli + Weiss, Ceal Floyer, Rodney Graham, Ellie Harrison, Debbie Lawson, Mike Marshall, Kirsten Pieroth, Pipilotti Rist, Mathew Sawyer, Ariel Schlesinger, Hank Schmidt in der Beek, Michael Shaw, Roman Signer, Charles Stankievech, Annika Ström, Bedwyr Williams, Dan Witz, and Erwin Wurm. 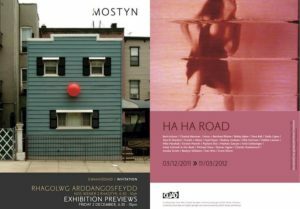 The exhibition was produced by QUAD, Derby, in collaboration with Mostyn Gallery, Llandudno, both UK.